Washington Redskins: Should They Bring Back Ty Nsekhe? Ty Nsekhe has flashed promise in a limited role on the Washington Redskins offensive line, but his future with the team shouldn’t be in question. 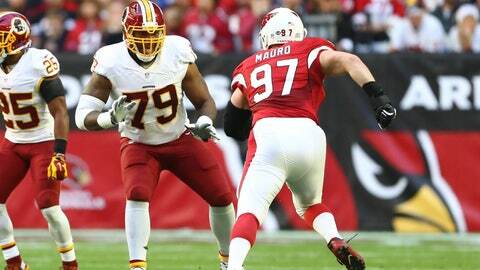 The Washington Redskins offensive line benefits from two talented tackles. Trent Williams is one of the best left tackles in football, while Morgan Moses is one of the fastest improving right tackles. Despite that, they can’t afford to lose Ty Nsekhe. It’s hard for the Redskins to complain about the play of their tackles. In fact, most of their offensive line is intact pretty well. Left tackle Trent Williams and right guard Brandon Scherff both made the Pro Bowl. Due to that, retaining some of their backups may not seem like the most pressing issue. That can’t be the case with Ty Nsekhe however. The 31-year-old tackle appeared in all 16 games, starting four. Time and time again, he proved just how valuable a solid backup can be. His massive frame (6-8, 335 pounds) already gives him that “wall” appeal of a lineman. Add in his surprising quickness, brute strength, and quick hands, and Nsekhe has the makings of a monster. His play in the four games he started, led fans to start asking questions. Was there any way to have Nsekhe, Williams, and Morgan Moses all in at the same time? It happened for a little, as Williams slotted over to left guard due to injuries. That made left tackle available for Nsekhe, while Moses remained at right tackle. For a little bit, this was the new fascination of Redskins fans. Move Williams to left guard permanently and challenge the Dallas Cowboys for best offensive line in football. There are two glaring problems with this, however. First off, Williams is one of (if not the best) left tackles in football. Moving him from that position just seems ridiculous. Second, despite being right next to each other, left tackle and left guard are two completely different positions. Asking someone to just switch flawlessly seems like a tall order. There’s a higher percentage chance that Williams play would suffer instead of improve. That would just leave the Redskins worse off at tackle, and with a now declining guard. However, the fact that he can’t start doesn’t diminish Nsekhe’s value. He started four games in 2016 and two in 2015. When someone on the offensive line can’t go (especially someone as talented as Williams) it leaves the offense in a bad spot. While offensive line isn’t the position that get’s the glory, it should be. Look at a team like the Los Angeles Rams. The line was absolutely miserable in 2016. This left Todd Gurley out to dry, and hindered the progression of Jared Goff. When the Redskins find themselves without a starter on the offensive line for whatever reason, it will be nice knowing that Nsekhe is there to stand in his place. If the Redskins were smart, they’d re-sign Nsekhe before another team snatches him up.